This article was originally published in The Shepherd Magazine. Written by Carol Densmore, Cross Wind Farm, Michigan. Learning to spin opened the door to the fiber arts world and led to the rediscovery of the hard work and farm life that I grew up in. As a hand spinner I knew I couldn’t live without some type of fiber producing livestock. And after a five-year stint of raising alpacas my search led to sheep. Then, I had a huge decision to make. What breed? After extensive breed research I was no closer to a decision. Each breed had its pros and cons. But once I laid eyes on Bluefaced Leicesters in 2007 the decision was made. The clean face and legs, Roman nose, and the distinct wool sealed the deal. And we’ve had BFLs ever since. The wool is an important feature but as shepherds the other aspects of the breed are also very important to my husband and I. The large size was just what we wanted, as it ensures the biggest possible fleece the breed can offer. 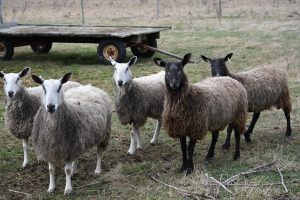 Compared to other breeds the BFLs do not have a hefty fleece—usually between three and five pounds—so the large size of the animal helps produce as much wool as possible. Some of the BFL wethers in my fiber flock produce the biggest fleeces. And because the face, neck, legs, and belly does not have any wool, it is a huge advantage and time saver when I shear, although I didn’t know it until we later introduced other longwool breeds. The wool itself is the best of all worlds. As a longwool you get the advantage of the long distinct locks that easily separate and are great for tail or core spinning yarn. On the fine-coarse spectrum BFL is the finest of the longwool breeds. With an average micron count of 24 -28 BFL wool is next to skin soft while maintaining its strong and durable traits. The tightly purled locks also add great texture to yarn or felted items. Currently we have 25 registered BFLs in our flock. That results in more fleeces than I want to hand process or have mill processed. Luckily, selling the fleeces is never a problem. They are sought after by many people ranging from fiber artists, wool enthusiasts, spinners, and felters. I’m contacted on a regular basis from people looking to purchase BFL fleeces. The feedback I receive about BFL wool is always positive. It’s a good basic wool that’s easy to work with and on the soft end of the spectrum. In my years raising and shearing BFLs I’ve noted a few reasons people gravitate to the wool. Even with a wide assortment of beautifully dyed, ready-to-use BFL wool that is available at festivals and online, there is still a segment of the fiber community that loves starting their projects from raw fleece; and for those, BFL is one of their top choices. The fleece size is very manageable. A four- to five-pound fleece is enough to create a garment like a sweater or several accessories. With the fine, denser locks a BFL fleece is easy to handle when washing as opposed to a fleece of the same weight that has wider, finer, or more voluminous locks. The smaller BFL fleeces are sought after by people who only need a couple of pounds because they are blending it with another fiber or want to use the individual locks for jewelry, felted pieces, and spinning textured yarns. 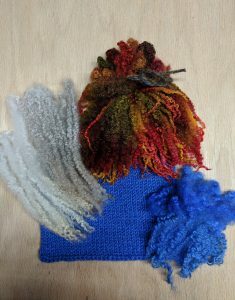 People who buy my fleeces comment that they like BFL because the staple length of three to six inches is great for many projects such as spinning woolen and worsted yarn, blending with exotic fibers, or using the purled locks to accent felted pieces. The dye pots are also a popular place for BFL because of its semi-lustrous characteristic. BFL takes dye beautifully either as locks or a combed or carded preparation. And the soft hand and beautiful drape you get is always an attraction. I find that hand processing my own BFL fleeces produces a softer product. Combing is my preferred method which produces a lovely worsted or semi-worsted yarn. Starting the combing process from the tightly purled locks can be a bit tricky. The thin locks tend to slip between the tines of my combs. But to avoid this challenge, I prepare a carded batt first then comb the batt. Works like a charm! A few years after we bought our starter BFL flock we introduced Lincoln Longwools, Romneys, and Border Leicesters. With the crossing abilities of the BFL ram we achieved great results breeding them with the other purebred longwools. The size, good fiber, and vigor in the crossbred lambs make them prime candidates for my fiber flock or valuable market lambs. My fiber flock keeps growing with BFL wethers, BFL crossbreds, and BFL ewes whose breeding time has come to an end. Even though the purebred BFLs stand out in the flock with their erect ears, alert eyes, and commanding stance, all of our sheep are touched by BFL genetics and many have it running through their veins. We’d have it no other way. Wow that was a great article. Thanks for the good wool tips and photos. I especially liked your comment about the long carcasses. Some times when we select for wide loins we forget about length of loin and overall carcass. Commanding stance is also a good description of a group of big ewes. How old are your fiber weathers? And how heavy are their fleeces? If they are somewhat energy deprived they would give finer fleeces than if they become fat I presume..